The OCMock static library contains only "categories" and not "classes"
OCMock static libraryThe OCMock Xcode project contains additional targets that build a static library of OCMock. When a test project links against this library (and not the framework) the OCMock classes are included in the binary itself, which means they can be run on an iOS device. The default library is built "fat", containing binary code for i386, which is required for the simulator, and armv7, which is required for running on the device. Thus, if a project requires both logic and application tests, it can do this by using the same library; the framework is not needed for either of them. If you have copied the library or headers to a different place all of these settings must be adjusted accordingly. Q: Why do I get a runtime exception of "selector not recognized" when linking against an Objective-C static library that contains categories? A: The "selector not recognized" runtime exception occurs due to an issue between the implementation of standard UNIX static libraries, the linker and the dynamic nature of Objective-C. Objective-C does not define linker symbols for each function (or method, in Objective-C) - instead, linker symbols are only generated for each class. If you extend a pre-existing class with categories, the linker does not know to associate the object code of the core class implementation and the category implementation. This prevents objects created in the resulting application from responding to a selector that is defined in the category. 1. 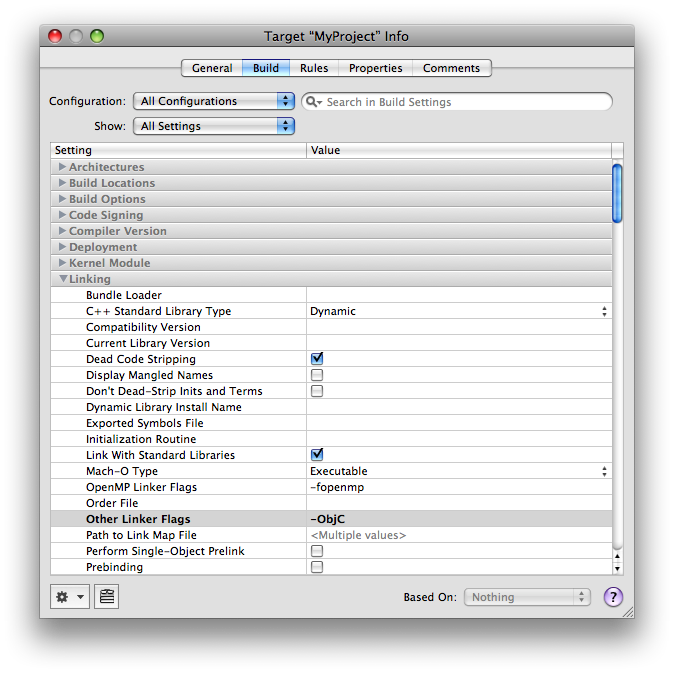 In Xcode, double-click the target's name under "Targets" in the Project window. 2. Choose the Build pane from the ensuing Info window. 3. Scroll down to the Other Linker Flags build setting under the Linking collection and set its value to -ObjC. IMPORTANT: For 64-bit and iPhone OS applications, there is a linker bug that prevents -ObjC from loading objects files from static libraries that contain only categories and no classes. The workaround is to use the -all_load or -force_load flags. 2010-04-30 Describes how to pass the "-ObjC" option to the linker. Updated for Mac OS X v10.6 and later. 2006-10-03 Changed "and" to "an" in order to make the content correct. 2006-09-25 New document that describes how to properly build Objective-C static libraries that contain categories on existing classes.